When bacteria, such as Neisseria meningitidis, invade the body, they are attacked by immune proteins called complement proteins. Complement proteins assist in bacterial killing via three pathways, the classical complement pathway, the alternative complement pathway or the lectin pathway. 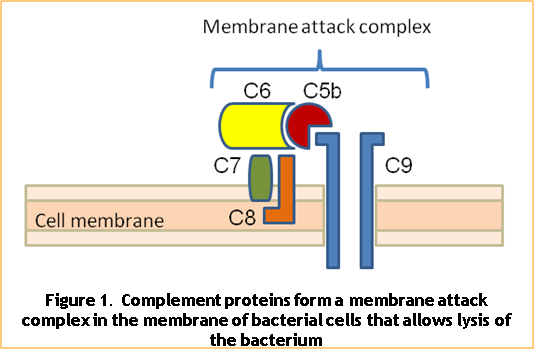 The first steps of the classical complement pathway require the binding of antibodies to the surface of the target bacterium. The antibodies then become targets for one particular complement protein complex, known as C1 – C1 binds to the tail (known as Fc region) of the antibody. Once bound, C1 initiates a cascade of cleavage and reforming of complement complexes that ends in the binding of several complement proteins to the surface of the bacterium in the form of a membrane attack complex (MAC) (Figure 1), or can generate opsonins that label a bacterium for destruction. MAC can insert into the cell membrane of Gram-negative, but not Gram-positive, bacteria. There, it produces pores that allow the entry of membrane damaging molecules, such as lysozyme, and makes the bacterium susceptible to osmotic lysis. The alternative complement pathway does not require antibody to initiate the lysis of bacteria. In this pathway, complement proteins from a complex known as C3 directly bind to bacteria and activate downstream components in the complement cascade, once again ending in formation of MAC that causes lysis of the bacterium. During the lectin pathway, mannan-binding lectin (MBL) binds to proteins containing mannose residues that are found in some types of bacteria (such as Salmonella spp.). Once bound, MBL forms a complex with an enzyme called MBL-activated serine protease (MASP). In this form, this enzyme activates C3 convertase (by cleaving C2 and C4 complement components) that participates in forming MAC. Bacteria may also be killed by phagocytes. Immune proteins like acute phase proteins (like complement) and antibodies bind to the surface of bacteria by a process called opsonisation. Opsonised bacteria are, therefore, coated with molecules that phagocytic cells recognise and respond to. Activated phagocytes engulf and destroy opsonised bacteria by a process called phagocytosis. Complement C3b is a particularly important opsonisation protein for controlling bacterial infections by this mechanism. Opsonisation allows killing of Gram-positive bacteria (e.g. Staphylococcus spp.) that are resistant to killing by MAC. After bacteria are ingested by phagocytosis (Figure 2), they are killed by various processes that occur inside the cell, and broken into small fragments by enzymes. Phagocytes present the fragments on their surface via class II major histocompatibility (MHC class II) molecules. Circulating helper T cells recognise these bacterial fragments and begin to produce proteins called cytokines. Two major groups of helper T cells are known as Th1 and Th2 cells. These cell types differ in the types of cytokine they secrete. Th1 cells predominantly produce interferon-g (IFN-g), which promotes cell-mediated immune mechanisms (see below). Th2 cells produce mostly interleukin-4 (IL-4), which promotes humoral immunity by activating B cells. B cells make antibodies that stick to extracellular bacteria and prevent their growth and survival. Some bacteria engulfed during phagocytosis avoid the killing mechanisms of the phagocyte to survive inside cells. Macrophages are a common targets for intracellular bacteria (e.g. Salmonella spp.) that live inside cell compartments. These bacteria cannot be detected by complement or antibody but, instead, are eliminated using a cell-mediated response. Infected macrophages present bacterial peptides on their cell surface using MHC class II molecules. This mechanism is called antigen presentation. A helper T cell surveys MHC class II molecules with its T-cell receptor (TCR) to observe the peptides they hold. 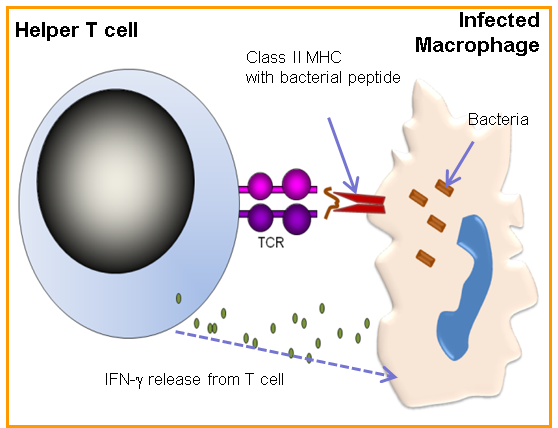 If a bacterial peptide is presented, the Th1 cell releases IFN-g. This cytokine stimulates killing mechanisms, (such as production of lysozyme) inside the infected macrophage to digest and destroy the invading bacterium. IFN-g also increases antigen presentation by cells, making the bacterium more visible to the immune system and more prone to attack (Figure 3).